Home » Blogs » TXICFW Moves Back to UT’s Campus! TXICFW Moves Back to UT’s Campus! The Texas Institute for Child and Family Wellbeing has moved back on to UT Austin’s campus! This past Monday, the TXICFW team relocated to a new home within John W. Hargis Hall. We are now adjacent to the Steve Hicks School of Social Work, serving as one of several SSW research institutes that will be moving into the building over the course of the next few months. It is incredibly exciting for us to be back on campus and surrounded by other passionate, dedicated researchers that are advocating for social justice in its various forms. In fact, it’s a rather fitting homage to our new home, given its history as a space that has honored people who have fought adversity for decades. Most recently known as the Freshman Admissions Center, Hargis Hall has existed in many iterations since being built in 1856. 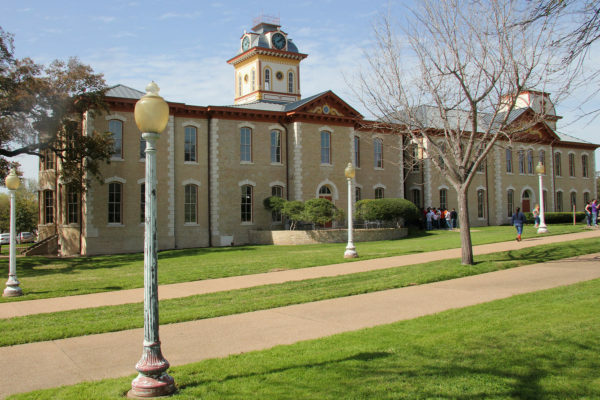 Originally housing the Texas Asylum for the Blind (now known as the Texas School for the Blind and Visually Impaired), it was bought in the 1920’s by the University of Texas at Austin. For a time, Hargis Hall was referred to as part of “Little Campus”; serving as a dormitory for men and women. Both World Wars occupied the building to operate as a temporary training space. In 1974, Little Campus was declared a United States historic district and added to the National Register of Historical Places. From those original historic campus structures, John W. Hargis Hall is only one of two buildings that has not been demolished. Our building’s namesake is in honor of the first African American to receive an undergraduate degree from UT Austin. Additionally, Hargis served as special advisor to the 24th President of the University before his death in 1986. In 1987, Little Campus was renamed the Heman Sweatt Campus, after a former UT Law student and civil rights activist who was largely known for challenging Jim Crow laws in the 1940’s and ‘50’s. In the Sweatt v. Painter lawsuit, Sweatt worked with the NAACP to challenge Jim Crow laws that had allowed UT Austin to deny his acceptance into its Law program on the basis of race alone. This case confronted the “separate but equal” doctrine in a litigation that was one of the first to help lead to the desegregation of American higher education. We are honored to share the history of those before us, and thrilled to be in a position to chart our Institute’s future. We’d like to extend a huge thank you to our Operations Coordinator Shannon Harris for doing such a wonderful job moving us into Hargis Hall. Stay tuned for other exciting developments as we settle in!